Moore said that he believes the justices followed their personal feelings rather than the rule of law. Moore also advised reporters that the Supreme Court can be petitioned for a re-hearing within 25 days of a ruling. He said that while it is rare for the court to do so, he hoped that the justices would consider the strong dissent in the case. The judge also said that he would continue to press for an amendment to the U.S. Constitution protecting the institution of marriage. 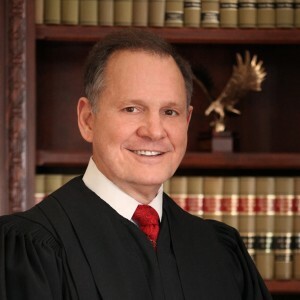 As previously reported, last February, Moore unveiled a draft amendment as he mailed letters to each governor, lieutenant governor and legislative body in all 50 states, urging the formation of a convention to add the language to the Constitution. “Nothing in this Constitution or in the constitution or laws of any state shall define or shall be construed to define marriage except as the union of one man and one woman, and no other union shall be recognized with the legal incidents thereof within the United States or any place subject to their jurisdiction,” it read. Moore noted that Article V of the U.S. Constitution allows for Congress to call a convention for proposed amendments that obtain the approval of two-thirds of the states. But regardless of whether or not a re-hearing is granted or an amendment is passed, he said that he believes that legal battles over the matter are far from over. He also made clear that he hold no animosity toward homosexuals, but does not believe the government has the right to change the definition of marriage for a select group of people. “They can celebrate and I’m sure they will, but they’re not celebrating because the Constitution was upheld. They’re celebrating because it was violated, and I think that’s the point. They’re celebrating because they got their way,” Moore told WKRG-TV.